The head coach of the Green Bay Packers for more than a decade, has been fired by the team following several years of declining team performance, finally tailing off in this year's disastrous run where the Pack trails well behind it's divisional rivals. It's a bittersweet moment. McCarthy led the team through adversity, starting with the decline of Brett Favre through the rocky transition to Rodgers who pulled off a spectacular Super Bowl win to cap off their 2010 season. It seemed that so long as he and Rodgers could get the ball, they could win. But, it seems the league as a whole has figured out their only winning strategy- with most teams focusing on Rodgers before going after their defense line for well-defined victories. It seems that McCarthy's inability to impart meaningful change, and to reintegrate his team into a competitive force like before was his downfall. Offensive Coordinator Joe Philbin has been named the interim head coach, but the Packers have stated they are already working to find a new coach even now. 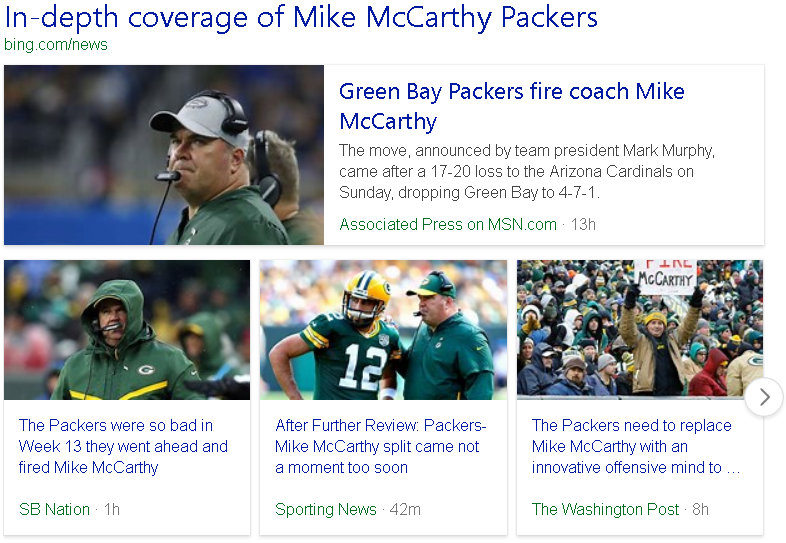 While I'm glad that the Packers will be getting a new coach who will (hopefully) turn their fortunes around, it is bittersweet to see McCarthy go. He's been a staple of the team, an icon not unlike Brett Favre himself with his almost ubiquitous connection to the team- it will be strange to have the Packers play without Mike McCarthy. Apparently, if Philbin does well he is going to get considerable consideration for the job. My guess is Aaron Rodgers is going to have a lot of say in things as well, so if the Packers win these last few games and Rodgers endorses Philbin, I think people in Cheesehead country have their new HC. Only time will tell what will happen though. Quote from spiderfan Apparently, if Philbin does well he is going to get considerable consideration for the job. My guess is Aaron Rodgers is going to have a lot of say in things as well, so if the Packers win these last few games and Rodgers endorses Philbin, I think people in Cheesehead country have their new HC. Only time will tell what will happen though. I wouldn't be averse to having Philbin get the job. He was hand-picked by McCarthy, and he has a tremendous amount of experience with the team as it is to make it a smooth transition. The biggest question is whether Philbin has a "direction" for the team now- if he can get them into a winning stance, he can take this thing as far as he can run with it, but that remains to be seen. I do wonder what Mike McCarthy is going to do now that his NFL career is (probably) over. As I doubt they air these commercials outside of Wisconsin, and there isn't going to be a better time to bring em' up, here's a couple of the many commercials of Coach Mike McCarthy for regional cellphone service company Cellcom. I guess I answered my own question- I'm sure Cellcom will hire him.